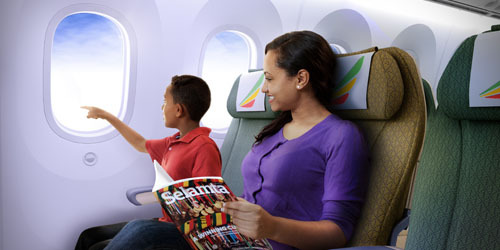 Ethiopian Airlines bookings qualify to participate in SouthAfrica.TO's travel vouchers for travel reviews program. Simply email a writeup of your flight to cheapflights@southafrica.to and we'll send you flight discount vouchers. 30 June 2017. Ethiopian Airlines dethroned SAA to become the 2017 Skytrax Best Airline in Africa! Don't be shy - ask for Help with Flight Quotes - our travel consultants are itching to show you the latest flight specials. ET phone home, then ET fly ET :) Named African Business of the Year for 2013, Ethiopian Airlines has come a long way in the last five years. They even managed to take top honours in the 2017 Skytrax awards as the Best Airline in Africa, dethroning South Africa's SAA. This is in line with the airline's commitment to deliver the best customer service partnered with the newest fleet and latest innovations. There are now Ethiopian Airlines flights (IATA code : ET) from Johannesburg, Cape Town and Durban to Addis Ababa, and onwards to many destinations in the rest of the world. The airline is a true national carrier, 100% owned by the country's government and operates the newest fleet in Africa (they have Boeing 787-8 Dreamliners for long-haul flights). They operate similar to the Middle Eastern airlines with all flights stopping at their hub Addis Abbaba (Ethiopia), but they do aim to make stop-overs as short as possible. Ethiopian Airline flights are often the most affordable, especially on European routes. Use the flight price comparison tool on the left to search for a cheap flight. Under no circumstances will a bag weighing more than 32kg be allowed on board the flight. The free baggage allowance on economy class varies depending on the route, from 23kg to 40kg. As of June 2016 the airline's operational fleet consists of 2 Airbus A350-900, 5 Boeing 737-500, 14 Boeing 757-200, 2 Boeing 737-500, 7 Boeing 767-300, 6 Boeing 777-200, 7 Boeing 777-300, 7 Boeing 787-8 and 17 Bombardier Dash 8 Q400. The airline has significantly grown their fleet over the last year and is the first African airline to own and operate a Boeing 787 Dreamliner. 12 March 2019. Sadly a tragic accident on Sunday, the 10th of March 2019, has resulted in the death of a 157 crew members and travellers. The accident happened 6 minutes after the aircraft took off from Addis Ababa and is the second involving a Boeing 737 MAX8. This has resulted in Ethiopian Airlines grounding their Boeing 737 MAX8 fleet, of which they currently own four. They took delivery of their first Boeing 737 MAX8 earlier this year. 14 August 2015. Following the launch of several new routes, Ethiopian airlines today announced plans to massively expand their fleet. They are going to add 44 new aircraft to their existing fleet of 76. As part of their Vision 2025, they aim on adding 20 Boeing 737 MAX 8s, 14 A350-900s, six Boeing 787 Dreamliners, two Boeing 787-9s, and two 777-200F Boeing freighters to their fleet over the next 10 years. 6 Feb 2014. Airlines seem to be upping a gear in the ordering of aircraft. Yesterday it was confirmed that LAM Mozambique had ordered 3 Boeing 737NGs. Further north in Africa, Ethiopian Airlines has firmed up an order for 4 Q400s & 4 options on Q400s, which will add to their existing 13 Q400s. 26 Jul 2013. Following the 12th July 2013 fire on a parked Ethiopian Airlines B787 at London Heathrow, the US FAA has issued airlines with an airworthiness directive to inspect or remove emergency locator transmitters (ELTs) on their 787s, and have a look for "discrepancies associated with the ELT, ELT battery, and associated wiring". This order is a step beyond the initial order last week to inspect the beacons for evidence of moisture and/or pinched wires. As the FAA doesn't require the B787s to have ELTs at all, Boeing have supported removing them temporarily whie investiation goes on. Following the first time major structural damage has been repaired on a hull made out of composite materials (mainly carbon-fiber reinforced plastics), on the 21st December 2013 the plane took a test flight over the North Sea. After a few test flights in England, on 23 December 2013 the plane returned to flying passengers around, starting with a flight from Frankfurt to Addis Ababa. 5 Jul 2013. The airline has received its 6th B777-200LR plane. "The 777-200LR's performance and range has allowed us to open direct routes from Washington D.C to Addis Ababa, Addis Ababa to Beijing, Toronto to Addis Ababa, as well as other long range routes. In line with our Vision 2025, we plan to provide more and more non-stop long haul flights to connect east, west, north and south, using the strategic location of our Addis Ababa hub. As we expand to South America and Far East Asia, this additional B777-200LR will let us take full advantage of the performance and economics of this great airplane," said the Chief Executive of Ethiopian Airlines, Tewolde Gebremariam. Similar to the Middle-Eastern airlines, Ethiopian Airlines connects South Africa to other parts of the world via their hub in Addis Ababa, Ethiopia. 11 March 2019. Sadly 157 passengers and crew members passed away on Sunday, the 10th of March 2019, when flight ET302 crashed only 6 minutes after take-off. While little details are currently available, this is the second fatal accident for a Boeing 737 MAX8 in recent months and has resulted in the airline grounding their entire Boeing 737 MAX8 fleet. Many airlines around the world will likely follow suit. 30 June 2017. Having the youngest fleet in Africa coupled with incredibly affordable flights and great customer service has certainly paid off as the airline recently took top honours in Africa at the 2017 Skytrax awards. Based on comprehensive customer feedback, the airline dethroned longstanding previous winner SAA, bumping them down to the second spot. 4 August 2016. The airline recently took delivery of their second Airbus A350 XWB. The airline plans to use it on their London, Lagos and Dubai routes. They have another twelve Airbus A350s on order. 14 March 2016. They are adding even more flights from Cape Town and Johannesburg. From the 1st of July 2016, they will operate 4 flights per week to Cape Town via Johannesburg and 4 direct flights from Addis Ababa. This will also increase their flights to Johannesburg to 11 per week. The airline also announced that they are replacing the Boeing 737 with a Boein 787 Dreamliner on the Cape Town route to improve capacity on this route and provide better product offerings in Economy and Business Class. 13 March 2016. The airline is launching their second flight to Delhi, India on the 28th of March 2016. Flight ET 688 will depart Addis Ababa at 15h50 to arrive in Delhi at 01h10 on the next day. The return flight ET 689 will depart Delhi at 09h30 to arrive in Addis Ababa at 14h00 on the same day. 30 June 2015: The airline will be operating 6 scheduled flights to Cape Town per week from the 30th of June 2015. Three morning flights will depart at 09h30 on Tuesdays, Thursdays and Saturdays. The other three flights will depart at 23h30 on Wednesdays, Fridays and Sundays. This has replaced the flights they launched earlier this year which went via OR Tambo. Feb 2015: Following SAA's cancellation of their direct Joburg to Mumbai flights, Ethiopian Airlines are increasing their direct flights from Addis Ababa to become a double daily service. They are also planning on expanding services to India following SAA's cancellation of all flights to the continent. March 2014. The airline has cancelled their route to Mahe Airport in the Seychelles, meaning there are no longer 1-stop flights from Johannesburg to the Seychelles via Addis Ababa. 3 Dec 2013. They recently launched flights from Addis Ababa to Singapore via Bangkok (BKK). Passengers cannot only book the Singapore to Bangkok leg. This creates another option for Johannesburg to Singapore flights via Addis Ababa and Bangkok. The flights will be flown 3 times a week with B767-300ER jets. 20 Nov 2013. The airline commences 4 weekly flights to Niamey in the Republic of Niger. 24 Aug 2013. They recently launched flights from Addis Ababa to Enugu in Nigeria, in a B737-800 with 153 pax. The airline is operating 4 flights a week on the route, and this opens the possibility of 1-stop flights from Johannesburg to Enugu via Addis Ababa. On the same date the airline is increasing its frequency of flights to Abuja from 5 a week to daily. 1 Jul 2013. They postponed their planned Addis Ababa to Manila (via Hong Kong) flights. No reason was given, although it's speculated that this is as a result of the lack of 5th freedoms between HKG & Manila. 2011 Ethiopian Airlines joins the Star Alliance. See our flights to Ethiopia page, for a full discussion of flight connections between South Africa and Ethiopia. 14 August 2015 : They are planning on launching a direct flight from Addis Ababa to Gaborone. 1 December 2016: The airline will start flying to Durban from Addis Ababa from the 16th of December 2015. The airline will operate three weekly flights between the two destinations, flights will depart on Wednesdays, Fridays and Sundays. The flight will depart Addis Ababa at 08h30 and arrive in Durban at 13h40. The return flight will depart at 14h40 and arrive in Addis Ababa at 21h40. 1 Jan 2014 : A codeshare agreement takes effect with Malaysia Airlines. Ethiopian Airlines will start selling the Malaysia Airlines flights from Addis Ababa to Kuala Lumpur on its booking engines. This means that Johannesburg to Kuala Lumpur flights booked with Ethiopian Airlines may have Malaysia Airlines flying the one leg of the trip. 18 Dec 2013. At the Best Travel Media Award Ceremony in Beijing, Ethiopian Airlines was voted "Africa's Best Business Class Airline". I would like to thank our Chinese customers for their strong vote of confidence. This award recognizes our global standard product with superior service delivery. With 28 weekly non-stop flights from four Cities in China operated with the superior comfort of the B787 Dreamliner and the B-777-200LR Worldlier, with SkyTrax award winning staff service and with efficient connections to 49 cities in Africa and Brazil, we are confident that Ethiopian is an airline of choice in the Chinese travelling public." said the Chief Exec of Ethiopian Airlines, Tewolde Gebremariam. The fact that the airline flies to 4 destinations in China (Hong Kong, Beijing, Guangzhou & Hangzhou), no doubt helped with them getting the nod. South African Airways has been struggling with the profitability of its Johannesburg to Beijing flight route. Ethiopian's success on this route makes one wonder why SAA is not more successful. 18 Dec 2013. Ethiopian Airlines flight ET815 on its way from Addis Ababa to Kilimanjaro, is diverted to Arusha Airport as a result of a disabled small plane on the runway. The Boeing 767-300ER (registered as ET-AQW) overshoots Arusha Municipal Airport's runway, coming to a halt with its nose gear and front tyre in the soft grass at the end of the runway. The photo on the left, by Richard Bodin of fastjet, shows the front tyre stuck in the grass. All crew and passengers got off the aircraft safely. "We regret the delay during the disembarking process and apologize to all passengers on-board the flight for the inconveniences caused." read a statement on the airline's website. As a result of the incident at Arusha, certain Precision Air flights were then diverted to Kilimanjaro International Airport (presumably the disabled light plane had by then been cleared from the runway). Questions are being asked about why the Ethiopian's B767 was diverted to Arusha with its short runway, instead of to Dar es Salaam or Nairobi. With the LAM Mozambique plane crash on the 29th November 2013, incidents involving African plane crashes are in the spotlight. For South Africans, this brings back memories of a similar incident with an SAA plane getting stuck at Cape Town Airport on the 2nd November 2007. The airline was named African Business of the Year on the 20th September 2013, at an awards ceremony at the Mandarin Oriental New York, at the African Business Awards 2013. 15 Sep 2013. They have ordered an additional eight Boeing 787 Dreamliner planes. 5 Sep 2013. Ethiopian Airlines credits their record profit in the last financial year to employee dedication and the fuel efficiency of their Boeing 787s. Kenyan authorities have turned down Ethiopian Airlines request to fly cargo between Nairobi and Johannesburg. 22 Jul 2013. Tewolde GebreMariam, the Chief Executive Officer of Ethiopian Airlines, has won the award for Regional Leadership from The Airline Strategy Awards. 4 Jul 2013. Consolidation in the airline industry continues, with Ethiopian Airlines buying a share in a new Malawi Airline Limited (the old Air Malawi is in liquidation). They will contribute 2 planes, and will own 49% of Air Malawi, and the Government of Malawi the other 51% (the plan is to sell 31% to Malawian citizens). 1 Jul 2013. The airline moves into its own offices in Johannesburg. Yohannes Teklu, their SA manager said that “The time was right for us to capitalise on our growing momentum in South Africa. Together with our recently established ticket office at OR Tambo International Airport our focus will be to provide Ethiopian Airlines customers with increased expertise, resources and support." 21 Jun 2013. An AU logo is placed on an Ethiopian Airlines B787 plane in recognition of them being chosen as the Oranisation of African Unity's official carrier. We are first and foremost a Pan-African airline, which has been serving the travel needs of Africa, both in good and bad times, for close to seven decades. For five decades, we have been working hand in hand with our continental organisation in bringing Africa together and closer to the world. Putting the OAU-AU 50th anniversary logo on an Ethiopian 787 aircraft is a fitting symbol of the renaissance of our great continent, which is leading the way in aviation technology by operating the most advanced commercial aircraft ahead of other regions in the world," said Ato Tewolde Gebremariam, the Chief Executive. January 2011. Tewolde GabreMariam takes over as CEO of the airline. 2013-06-18 To celebrate their Johannesburg to Seoul (via Addis Ababa) flight route, the airline is offering a special of R9009 return (excluding taxes & fuel surcharges). * The longer the length of time since the date of the special, the more likely it is that airfares have changed. Ethiopian Airlines flight ET808 is scheduled to leave OR Tambo International Airport every day at at 14h20, and scheduled to arrive in Addis Ababa at 20h50.